American studio Haus has created a countryside home that consists of interlocking boxes clad in ash, concrete and cement board and a large overhanging roof that shelters an Airstream trailer. 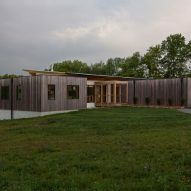 The Copperwood house – named after the colour of the surrounding landscape – is situated on a sloping 20-acre (eight-hectare) site in Zionsville, a town in central Indiana. It was designed for a family of four who wanted an energy-efficient and modern-style dwelling. Only a small portion of the client's property was suitable for construction due to the presence of wetlands and an abandoned pipeline. The architects wanted to orient the home on an east-west axis for passive solar purposes, but the angled pipeline made that difficult. "Ultimately the pipeline became a major driver of the design concept, resulting in an offset series of bars forming a bedroom wing, living wing, and garage wing – each perpendicular to the other, forming a Z-layout," said Haus, a design studio based in Indianapolis. "Each component steps with the angle while maintaining the desired solar orientation and orthogonal relationships, which also happened to work perfectly for desired views and site access." The rural home is accessed via an easement road that was formerly a rail line, and is fronted by a new gravel driveway that provides "the most complimentary approach". A wooden walkway leads to a recessed front door, which is sheltered by a deep roof overhang. The upper portions of the home are wrapped in white cement boards with exposed fasteners, and thermally treated ash that is meant to weather over time. The thermal treatment helps increase the wood's resistance to water and decay. The lower level is enclosed in concrete. Ample glazing delivers natural light to the main living spaces and bedrooms. To bring daylight to the lower floor, the team created a light well with terraced planters, which is situated on the entrance side of the residence. One of the home's distinctive elements is a large carport that accommodates the family's Airstream – a model of trailer with a rounded shape and polished aluminium exterior. 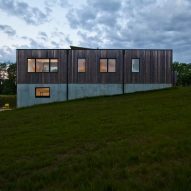 "Before engaging the architect, the homeowner had researched prefabricated structures to protect their Airstream, but once we got into the design process, we were confident that the Airstream could provide a unique design opportunity," the architects said. "Its placement and turn-around became a driver of the design, quickly leading to the wing-roof structure sheltering not just the main living space, but also the covered outdoor space and Airstream dock." Encompassing 4,200 square feet (390 square metres), the home features a fluid layout and a restrained material palette. The eastern wing houses two bedrooms and a master suite, while the central volume contains an open-plan zone for living, dining and cooking. "The kitchen space features front and back areas with pass-through to serve outdoor entertaining," the architects said. The lower level encompasses an entertainment room and a large area for regulation-level table tennis – the owner is a nationally ranked player. It also contains a spare bedroom and mechanical space. 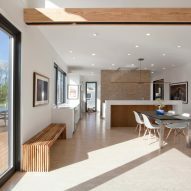 The residence has a number of sustainable features, including a geothermal heating, ventilation and air condition (HVAC) system; low-energy appliances and lighting; and smart controls. Haus served as the construction manager for the project via its sister company, Werk. 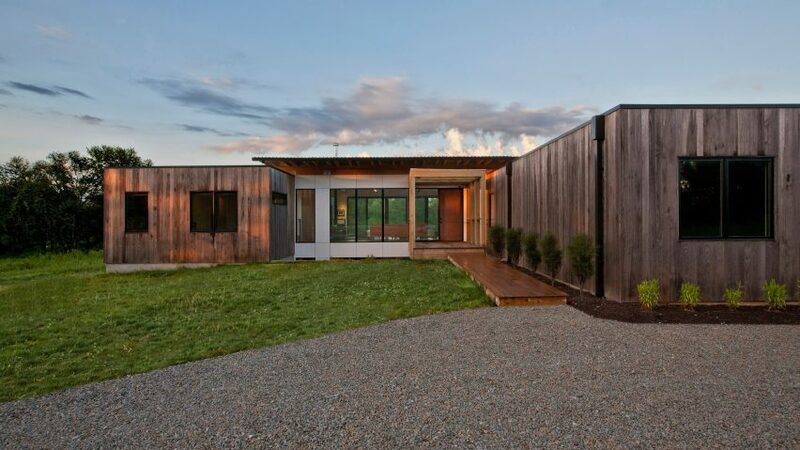 Other contemporary homes in Indiana include a compact dwelling by Bamesberger Architecture that was built next to a wetland, while the city of Columbus in the state is home to a number of notable works by famed architects such as Eero Saarinen and IM Pei – which were spotlighted in a feature film released last year. Photography is by Haus (exterior) and Haus + The Home Aesthetic (interior).